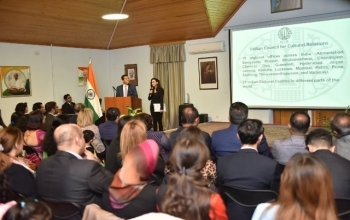 Embassy of India celebrated the Foundation Day of the Indian Council for Cultural Relations (ICCR) on 9th April 2019 at the Embassy premises. Prof. Isa Habbibeyli, Director of the Institute of Literature named after Nisami Ganjavi, who visited India last month under ICCR’s Academic Visitor’s Programme, was the Guest of Honour at the event. Addressing the gathering, Ambassador Mr. Vanlalvawna outlined ICCR’s activities in fostering and strengthening cultural relations between India and other countries. The Hindi teacher and students of the Azerbaijan University of Languages (AUL), where ICCR established a Hindi Chair, actively participated in the event.